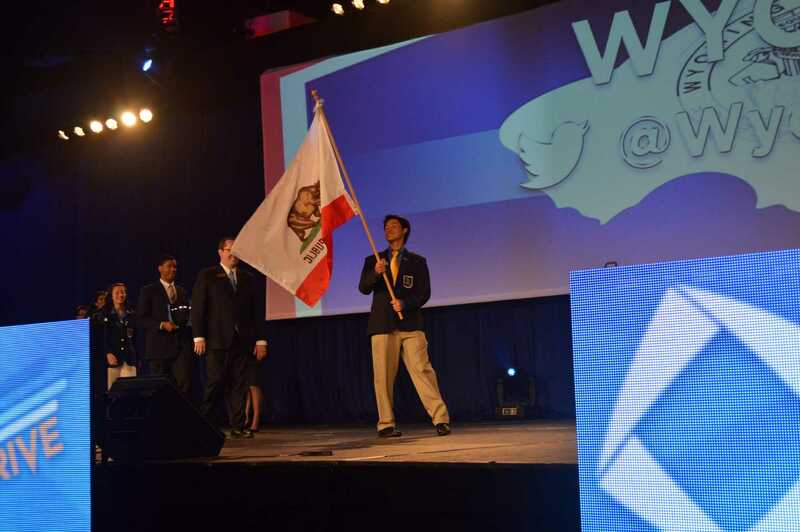 Members of California DECA walk across the stage during the ICDC opening ceremony. Eighteen Upper School students attended ICDC to participate in business competitions and leadership programs. Eighteen Harker Business Club (HBC) members attended the 67th annual DECA International Career Development Conference (ICDC) in Anaheim last week, with 10 being named finalists out of over 16,500 competitors from nine countries. Senior Carlos Johnson-Cruz and juniors Rebecca Chen, Connie Li, Adarsh Battu, Gaurav Kumar, Andy Wang, Dennis Moon, and Kenny Zhang placed in the top 20 in their events. Senior Michaela Kastelman and junior Sachin Vadodaria placed in the top 10 in their events. Most of the students participated in written events, which include a 5-30 page business plan and an oral presentation, or roleplay events, which consist of oral presentations of impromptu plans. Freshmen Sophia Luo and Shannon Hong did not qualify to compete in the DECA events but instead attended leadership development and management academies. These were held to teach students about teamwork, communication, and decision-making skills in a non-competitive format. Outside of the competition, students spent their time exploring the Downtown Disney district and interacting with students from across the world. According to Connie, some of the highlights of the trip were “walking through Downtown Disney and yelling ‘DECA’ to other students and trading [her] Georgia, Virginia, and Pennsylvania pins for a gold sequined Nevada hat” in a souvenir exchange. Most of the attendees viewed ICDC as not only a competition but also an exciting social experience. ICDC is the final competition for DECA this year.